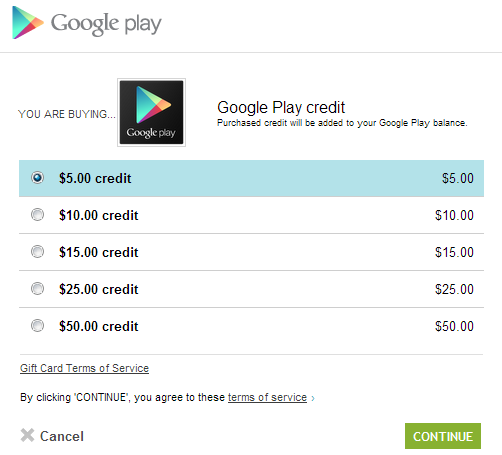 Note: You may only purchase Google Play credit to add to your own Google Play balance - at this time, it is not possible, aside from purchasing a physical Google Play gift card from a retail store, to add to another user’s Google Play balance as a gift. Google has just introduced a brand-new feature on the Play Store that's sure to be useful to many people - Play Store credit is now purchasable directly through the Play Store site. You can find the new option at the bottom of any Play Storage page, near the "Buy Gift Card" link. At this point, we're not sure how many countries have this option enabled, but this is undoubtedly a lot easier than heading down to your local Target and picking up a physical Play Store gift card, introduced back in August, if you don't actually need to. Buying straight from the web is probably especially cool for parents with children who own Android devices. The credit is available in various increments, from $5 to $50. Is Play Store credit available in your country? Let us know in the comments!